The North Saskatchewan River is a glacier-fed river flowing east from the Canadian Rockies to central Saskatchewan . It is one of two major rivers that join to make up the Saskatchewan River. The Saskatchewan River system is the largest in western Canada, including most of southern Alberta and southern Saskatchewan, and crossing into central Manitoba. The Bridge River Ash is in the vicinity of the North Saskatchewan River, which erupted from Mount Meager in southwestern British Columbia about 2350 years ago. The section of the North Saskatchewan river that falls within the Banff National Park boundaries has been designated a Canadian Heritage River in 1989, for its importance in the development of the western Canada. Edmonton's North Saskatchewan River valley parks system is the largest system of urban parks in Canada, and covers both sides of the river valley's course through Edmonton. The Saskatchewan River drainage basin. North Saskatchewan river has a length of 1,287 km (800 mi), and a drainage area of 122,800 km2. At its end point at Saskatchewan River Forks it has a mean discharge of 245 m3/s. The yearly discharge at the Alberta/Saskatchewan border is more than 7 billion m3. The river begins above 1,800 metres at the toe of the Saskatchewan Glacier in the Columbia Icefield , and flows southeast through Banff National Park alongside the Icefields Parkway. At the junction of the David Thompson Highway (Highway 11), it initially turns northeast for 10 kilometres before switching to a more direct eastern flow for about 30 km. At this point, it turns north where it eventually arrives at Abraham Lake . Bighorn Dam constricts the north end of Abraham Lake , where the North Saskatchewan emerges to track eastward to Rocky Mountain House. At Rocky Mountain House, the river abruptly turns north again for 100 km where it switches east towards Edmonton, Alberta . In Edmonton, the river passes through the centre of the city in a northeasterly direction and out towards Smoky Lake at which point it quickly changes to the southeast and then more to the east as it makes it way to the Alberta-Saskatchewan boundary. From the Saskatchewan boundary, the river flows southeast between North Battleford and Battleford and on in the direction of Saskatoon . About 40 km northwest of Saskatoon, near Langham , the river veers to the northeast where it passes through Prince Albert . About 30 km east of Prince Albert, the North Saskatchewan River joins the South Saskatchewan River at Saskatchewan River Forks to become the Saskatchewan River. From here, the river flows east to Tobin Lake and into Manitoba , eventually emptying into Lake Winnipeg . The river course can be divided into five distinct sections. The first, the eastern slopes of the Rocky Mountains, is the smallest area geographically, although the largest in terms of run-off and contributed water flow. The glaciers and perpetual snows of the mountain peaks feed the river year-round. Mountains, with little vegetation, experience the fasting melting snow cover. The second section of the river comprises the foothills region. The terrain is hilly and rough, with a deeper and more defined valley. This area is well covered with forest and muskeg, and run-off into the river is much more constant and stable than in the mountains.From Edmonton to the mouth of the Vermilion River, the North Saskatchewan flows through the plains-parkland divide, with occasional stretches of prairie. Here the river runs in a well-defined valley with deep cuts in the landscape. The fourth section, from the Vermilion River to Prince Albert is principally prairie with a few small stretches of timber and secondary forest cover. The valley of the river is much wider, and the river itself spreads out across shallow water and flows over many shifting sand bars. Low-lying, flat areas, border the river for much of this section. The final section of the river, from Prince Albert to the Forks, has many rapids. The valley is more shallow than the previous sections of the river, and the channel is much better defined. There is little prairie and much tree cover in this section. Like all rivers, the North Saskatchewan is subject to periodic flooding, beginning with rapid snowmelt in the mountains or prolonged periods of rain in the river basin. With the establishment of permanent communities along the river's course, and the rise of an administrative/government structure, records exist recording floods in the North Saskatchewan for the past century. The Bighorn Dam , constructed in the early 1970s near Nordegg, Alberta , and the Brazeau Dam, constructed in the mid-1960s, have both dramatically reduced occurrences of flooding in the North Saskatchewan River. 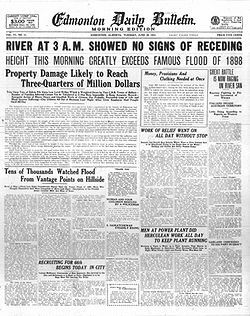 The 1915 flood of the North Saskatchewan River was one of the most dramatic in the history of Edmonton . On 28 June, the Edmonton Bulletin reported the river had risen "10 feet in as many hours." A frantic phone call from Rocky Mountain House alerted local authorities to the flood's arrival. The Canadian National Railway had parked a number of train cars on the city's low level bridge to protect against the "tons upon tons of debris" that had been pushed up against its pillars, including a house swept away by the current. Thousands of Edmonton residents watched the flood destroy lumber mills along the city's river valley. The North Saskatchewan River has always been a major trade route from Hudson Bay and central Canada across the plains and towards the Rocky Mountains. During the fur trade era, birch bark canoes and york boats traveled up and down the Saskatchewan delivering trade goods and amassing furs for transportation to Europe. The North Saskatchewan also witnessed a lively, although short-lived, era of steamboat shipping during the 1870s, 1880s, and 1890s. The Hudson's Bay Company purchased a number of steamboats from companies operating on the Red River and trading at Winnipeg /Fort Garry . The Company desired to avoid paying the labour costs of fur trade brigades, and felt steamboat shipping provided a suitable alternative. A number of HBC steamboats did navigate the river intermittently over two decades, although fluctuating water levels and natural barriers (rapids and sandbars) hampered efficient operation of the HBC fleet. With the arrival of the railroad in Western Canada, steamboat shipping on the Saskatchewan came to an end. A number of dams have been planned and constructed on the North Saskatchewan River and its tributaries. No singular purpose has dominated dam planning in the basin, indeed, hydroelectric development, flood control, and water diversion schemes have all underpinned proposals to construct dams on the river. The first hydroelectric development on the North Saskatchewan was planned in 1910 near the town of Drayton Valley . Funding for the plan came from a British Syndicate; design and construction were to be carried out by the Edmonton Hydro-Electric Power Scheme. The development was shelved after the outbreak of World War I. The La Colle Falls hydroelectric project east of Prince Albert was a half-built failure. Construction began in the 1910s and was later abandoned. The City remained in debt from financing the project until 1960, and the site still attracts tourists today..
A major dam was planned on the North Saskatchewan near the hamlet of Hairy Hill, Alberta, about 100 miles downstream from Edmonton during the 1960s and 1970s. This dam was part of a larger water diversion scheme conceived by the Alberta Government to transfer water from the Peace, Smoky, and Athabasca rivers to the Saskatchewan River Basin. The planned dam had a maximum height of 212 feet, with a crest length of 5,760 feet, which would have created a reservoir capable of holding over four million acre-feet of water. The reservoir would have affected municipal water works in the city of Fort Saskatchewan , was likely to inundate part of the Saddle Lake Indian Reserve, and would have flooded a number of oil and gas fields in the area. The plan was later shelved in light of economic and environmental concerns. The Bighorn Dam was constructed near Nordegg and created Lake Abraham , one of the largest reservoirs in Alberta. The dam was constructed in 1971 by Transalta. One of the North Saskatchewan's major tributaries, the Brazeau River, houses the Brazeau Hydroelectric Dam. The Brazeau Dam is Alberta's largest hydroelectric facility, and was built in 1965 by Transalta. Surveys of the North Saskatchewan River: 1910-1915. Edmonton: Government of the Province of Alberta, Department of Water Resources, 1917. Pages 50-53. Research Council of Alberta, Highways Division. Hyrdologic Data on Floods in the North Saskatchewan River. (Edmonton: Research Council of Alberta, 1965). Environment Canada, Water Survey of Canada, retrieved 11 January 2009. The Edmonton Bulletin, 28 June 1915. The Edmonton Bulletin, 29 June 1915. Bruce Peel, Steamboats on the Saskatchewan, (Saskatoon: Prairie Books, 1972). Loosmore, W. S. B. To Trail's End: Early Settlement in Drayton Valley. Drayton Valley: Drayton Valley and District Historical Society, 1994. Pages 10-14. Prairie Farm Rehabilitation Administration, Engineering Services, Alberta Regional Division. Hariy Hill Dam—North Saskatchewan River, Engineering Report. Calgary: Saskatchewan-Nelson Basin Board, 1970. Milholland, Billie. North Saskatchewan River Guide: Mountain to Prairie a Living Landscape. Edmonton: North Saskatchewan Watershed Alliance, 2002.